Your rule memos are excellent and I'm really learning a lot from them. It will be in the intelligence handbooks. Check any of your books where there is an GERMAN HMG platoon. For example, Eastern Front page 62. 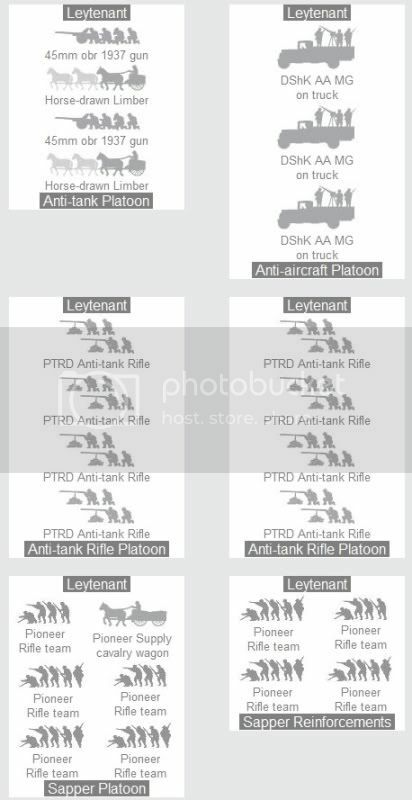 It says Grenadier Machine-gun platoons may make combat attachments to combat platoons. says the same thing for soviet flame thrower platoons on page 225. If you choose the leaderless platoon route, they can contest objectives. I have used this rule a couple of times to my advantage by "dragging" the HQ option along with the 1iC and 2iC all the way across the board to claim an objective. The Independent Team itself cannot contest, but the leaderless platoon can. ya good point. They work exactly like a regular platoon. Just with out a leader. I guess one other thing that should be mentioned is that the HQ and 2iC CANNOT appoint a new commander for that leaderless platoon, where normally they can if the platoons leader gets killed. If you guys really like these spread the word around the FoW community. I would like to do them more regularly. But I'd like to see people asking questions. On the Rules nazi tab at the top people could post topics they'd like to see me cover. I some times don't have any ideas unless I go to a tournament and see people making common mistakes. I can't seem to find the "post" link or button on the Rules Nazi tab. I am sure it is user error on my part. Assaults are the most often fubared part of the rules. Charge into Contact comes to mind right away. The old "Independent Team" stuff comes up as well. hmm looks like you are right you can't add a message. i'll have to see if I can add that some how. Buildings might be a good one for future Rules episodes. Seen them abused in games by new and experienced players. oh buildings...that is a good idea. seen a few troubles with buildings at the last few tournaments as well. I've learn't loads through these rules memos. Very, very useful. Once the game starts can the IC or 2IC appoint a new Pl leader for these assets instead of shooting? Negative. these leaderless platoons cannot be assigned a new leader. Kage,there are some exceptions with combat attahments.Have a look in River of heroes the SS can CA the scout plt form Div support for 1. Of course there are exceptions. I just cover the basics so people can understand. Then any exceptions to the rule that an intelligence book might bring in are easy. Its not the exceptions people have problems with, its knowing the rule properly in the first place.